For example, a wedge inserted into the inner (medial) side of the sole of a shoe can be used to help support a flatfoot, thus reducing the risk of tendinitis. An ankle-foot brace can help relieve the pain of rheumatoid arthritis in the heel or ankle. A heel flare can be used to increase support and help prevent ankle sprains. Heel cushions can help absorb impact and relieve stress on the heel and ankle when you walk or run. The type of orthosis recommended by your doctor will depend on your symptoms, the underlying cause for those symptoms, and the shape of your feet. In some cases, your doctor may prescribe an insert or pad; in other cases, modifications to your shoes may be necessary. Although custom orthoses are considerably more expensive than off-the-shelf devices, they last much longer and provide more support or correction. In some cases, however, an over-the-counter device can be just as effective, particularly when combined with a stretching and exercise program. 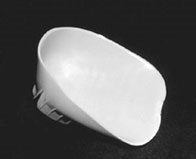 In the past, plaster molds of the foot were used to construct the custom-made orthosis. Now, computerized foot analysis is often used to develop orthoses that more accurately reflect the dynamics of your gait. The chart below shows which orthotic devices are commonly recommended for various foot conditions. Consult your physician before buying or using an orthotic device on your own; if you select the wrong type of device, you could change the mechanics of your gait and cause problems instead of curing them. If located on or between the toes, a toe separator may be helpful. No device needed if there are no symptoms or pain. If there is pain or aching, a semirigid insert or long arch pad, inner heel wedge or extended heel counter may help. No special orthotic device or shoe treatment is indicated. Most infants have flatfeet, and 97 percent will grow out of it.